The global biomedical refrigerators and freezers market is fragmented in nature and hence display deep competitive rivalry amongst the already established players. This is the main reason why companies in this market are putting in efforts in order to sustain in the market through constant innovation. The leading companies in the market are Eppendorf AG, Thermo Fisher Scientific, Inc., Helmer Scientific, and Panasonic Healthcare Co., Ltd. These companies are leading the market owing to the extensive product range being introduced by them, robust marketing strategies, and their increasing geographic presence, as per Transparency Market Research (TMR). The global biomedical refrigerators and freezers market is predicted to touch US$4,003.003 mn in 2022. On the basis of type, the segment of plasma freezers is predicted to lead the market over the forecast horizon. The reason for the dominance of this segment includes the rising count of apheresis procedures and the increasing demand to store fresh frozen plasma. In addition, plasma exchange has come up as the most extensively employed apheresis procedures within the U.S. This will raise the adoption of plasma freezers in research laboratories, hospital settings, and blood banks, thus propelling the growth of the overall market. The global plasma freezers market is predicted to touch US$1,195.515 mn in 2022. On the basis of end user, the segment of blood banks led the market in the past owing to the rising availability of expensive freezers and refrigerators within blood banks. On the other hand, the segment of research laboratories is predicted to hold the most lucrative opportunity in the market in forthcoming years owing to growing development in life science research in the developing and developed regions. In addition, the increasing support by government for the production of personalized medicines within developed regions will also fuel the growth of this segment. 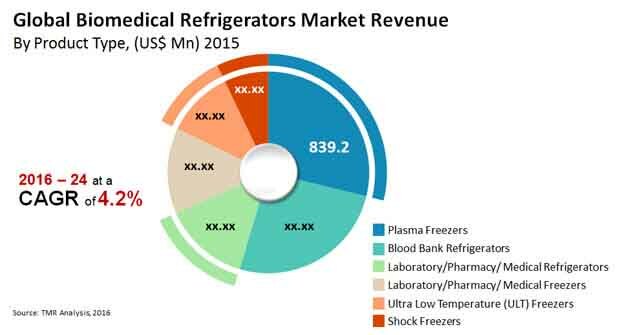 Geographically, the North America biomedical refrigerators and freezers market emerged as the top market due to the proliferation of R&D institutes, increasing adoption of cutting-edge technologies, and the advanced healthcare infrastructure of this region. On the other hand, the Asia Pacific biomedical refrigerators and freezers market is poised to rise at the swiftest 6.4% CAGR over the forecast period. This is owing to increasing research and development done by the developing economies and the growing industry for medical tourism in the region of Asia Pacific. There is an increasing occurrence of organ failures globally. Hence, the global biomedical refrigerators and freezers market is predicted to rise due to the rising demand for organ transplant and biopharmaceuticals. In addition, the growing support provided by government on clinical trials and research activities will positively impact the growth of the biomedical refrigerators and freezers market. Furthermore, technological developments have introduced a paradigm shift from the utilization of conventional equipment to developed technology-based equipment offering efficient energy consumption. Thus, the introduction of numerous technological developments in biomedical refrigerators and freezers are expected to bode well for the growth of the market for biomedical refrigerators and freezers. On the other hand, this market is highly fragmented in nature and this may result in lower revenues and higher volumes, thus negatively impacting the development of the market. “The increasing usage of refurbished equipment and huge cost of biomedical refrigerators and freezers may also pull back their demand, thus restraining market growth,” says a TMR analyst. Nonetheless, the growing focus on commercialization and branding of freezers will bring new growth opportunities in the market, states a TMR analyst.